pedestrians rather than drivers in a car accident. That’s just one of many smart safety features on display in its latest model of the Volvo V40 compact car. The pedestrian airbag inflates across one-third of the windshield and raises the back of the car hood as soon as the bumper detects a collision with a person. Such technology could cut down on lethal encounters between humans and cars that lead to U.S. pedestrians making up 12 percent of all traffic fatalities — a sobering statistic that is over 25 percent in China. According to Thomas Broberg, senior safety advisor for Volvo the all-new V40 is the most compact car in V-range which has class-leading safety, “It is also packed with more intelligent support systems than any previous Volvo. 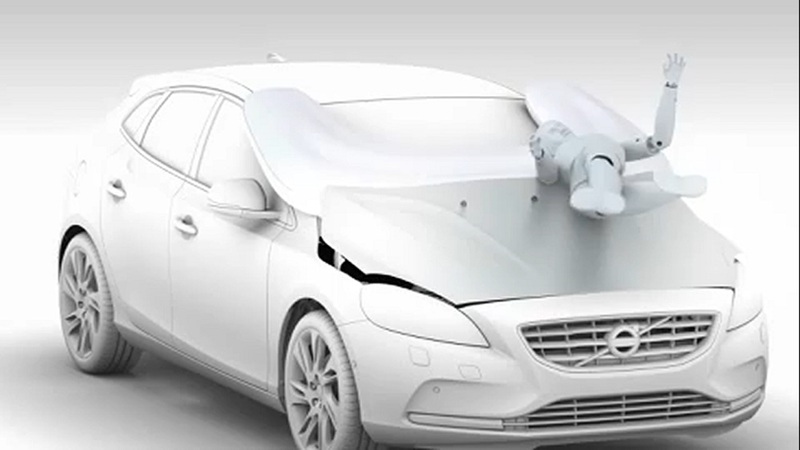 Yet another important step toward our vision that nobody should die or suffer serious injuries in a new Volvo car by the year 2020.” Volvo only plans for the airbag to act as a last defense against injuring or killing pedestrians. Its car also represents the first in its vehicle class to include a “pedestrian detection” system that warns the driver with a loud noise and flashing light if it’s headed toward a person. Even if the driver fails to respond in time, the car can automatically hit the brakes. That system uses radar to detect pedestrians in front of the car and predict whether he or she will step in the car’s path. A similar “collision warning” system can also apply the brakes if it detects the driver is headed toward a probable car crash, and can avoid disaster even with vehicle speed differences of up to 22 mph (35 kph).